Clear, strong lines and radiant colors that seem to smile at the reader characterize Mies van Hout's drawings. In Happy, Mies shows all the emotions a young child encounters. Each double page spread is devoted to one fish, showing a particular emotion with its name in lettering that expresses the same feeling. Swim into Happy where the dazzling fish sparkle against the dark background and let the images spark laughter and empathy. Mies van Hout (1962) studied at the Arts Academy in Groningen, where she majored in graphic design. She has been working as a freelance illustrator and graphic designer since 1989. Over the years, she illustrated quite a lot of children's books. Her illustrations are cheerful and witty, painted skillfully and distinctly. 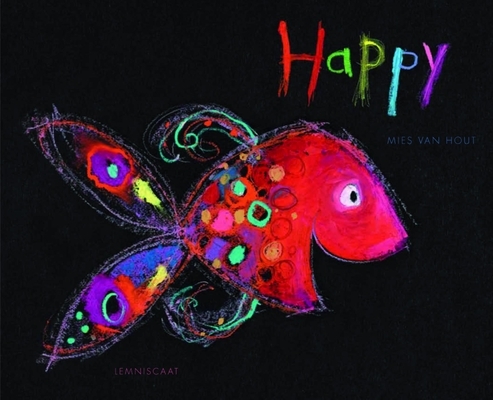 For Lemniscaat USA, Mies van Hout illustrated "Brave Ben," "The Child Cruncher," "Lovey and Dovey" and "Mine!"